100% natural organic stone-ground green tea leaves. Japanese matcha. Directions: 1 tsp per 1 cup of liquid. 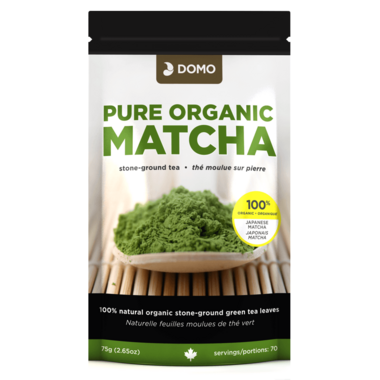 Ingredients: 100% stone-ground green tea leaves. In case of this green tea powder we get exactly what we paid for. If we do call the product "matcha" then it's a very low quality matcha, dull yellowish green powder with a taste far from high quality ceremonial matcha. If we call this "green tea powder" then your taste buds will tell you if this product is for you. I am not disappointed as I didn't hold my breath when I paid 15 dollars for 75 gram of what is supposed to be an expensive product. I got it out of curiosity to see what it is. It could be an old leaf picked later in summer or a blend with some portion of good quality matcha. Taste wise the product is not exciting. The quality seems good but the flavor for me is very fishy. Iâ€™ve tried mixing in maple syrup or sweeteners and milk but canâ€™t seem to get past that flavor. Good quality product. Best quantity for price!